The load current at which the efficiency attains maximum value is denoted as I2m and maximum efficiency is denoted as ηmax. 1. Condition for maximum efficiency. 2. 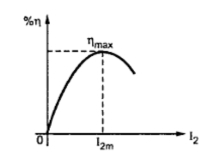 Load current at which ηmax occurs. 3. KVA supplied at maximum efficiency. This is the load current at ηmax interms of full load current. For constant V2 the KVA supplied is the function of. i) Efficiency at full load, 0.8 lagging p.f. iii) Maximum efficiency at 0.8 lagging p.f.